A friend of ours brought some of this Michigan cider to our place the other night. 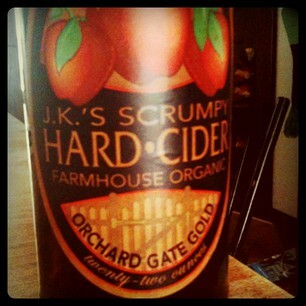 J.K.’s Scrumpy Hard Cider is a USDA certified organic cider. The bottle claims that the cider is fermented naturally in small artisanal batches from apples harvested at Koan Family Orchards in Flushing, MI. The company boasts its history (since 1860), and states that the recipe is unchanged since the great depression. The cider was of a honeyish, brown color; quite darker than I know ciders. That was definitely a surprise. The first taste I got was pretty sweet. It gave you a good mouthful of cider, the texture being rather thick. It tasted strongly of yellow apples, with honey notes towards the end. For my taste, Scrumpy was too sweet and too heavy to be truly refreshing in summer heat. I am just looking for lighter refreshment these days. But I can imagine this one going down much better as the later fall days arrive…and be a really nice drink when the cold Michigan winters reach us. In Hamburg, Alsterwasser was considered refreshing–Weizenbier mixed with Zitronenbrauser oder Limonade. Strange, but it goes on one. Did your region mix anything with beer to lighten it up for summer? Could you picture this scrumpy spritzed with club soda (is it sweet/heavy enough? to do that). I’m not fond of syrupy sweet beverages, not even when it’s cold. The Alsterwasser (or Radler in the South) is ubiquitous in Germany. I am very fond of it, usually pilsner mixed with lemonade. In wine regions, they mix cheap wines with sparkling water or lemonade for “Schoppen” (approximately pint size). They can be quite refreshing in heat.